Having too many links to other sites is bad for SEO. Now you can add a nofollow tag to links to avoid this problem. Right now, as you read this, your site is bleeding PageRank. Every link that you place on a web page makes another little hole in your site. Your users drop through that hole...and your PageRank goes with them. Of course, you need to have links on your site. It's almost impossible to build a site without them. So what can you do to make sure your links don't drag down your PageRank and lower your position in the search engines? Indirect Link is a feature designed to protect your PageRank and improve your knowledge of your site. You can retain your site's Google ranking by linking your outgoing links to a URL inside your site first and then to the final destination's URL. As a helpful bonus, it also counts the number of times people click on those links. 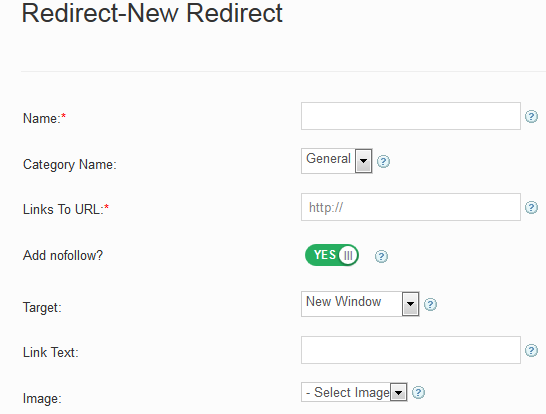 You can add as many indirect links as you want to other sites without harming your own site's PageRank! We think that's already pretty neat, but our Indirect Link feature does even more than that - it also tracks the clicks for each indirect link so you can pick up even more detailed information about what your users are doing and what they want to read on your site. Choose if you want Joomla no follow or not. Preview and test the destination page's URL. Create Links to external websites without bleeding PageRank. Choose if you want to open the link in a new window or in the same window. Keep track of the number of clicks for links to internal and external websites. Indirect links can have an image assigned to them which causes the Indirect Link to act like a banner.